1 is currently used by many large organizations including banks, health care organizations, educational institutions and government agencies. Thousands of organizations rely on File- Cloud for their file sharing and collaboration needs. Our customers handle sensitive data and they give utmost importance to data security, system ownership and regulatory compliance. 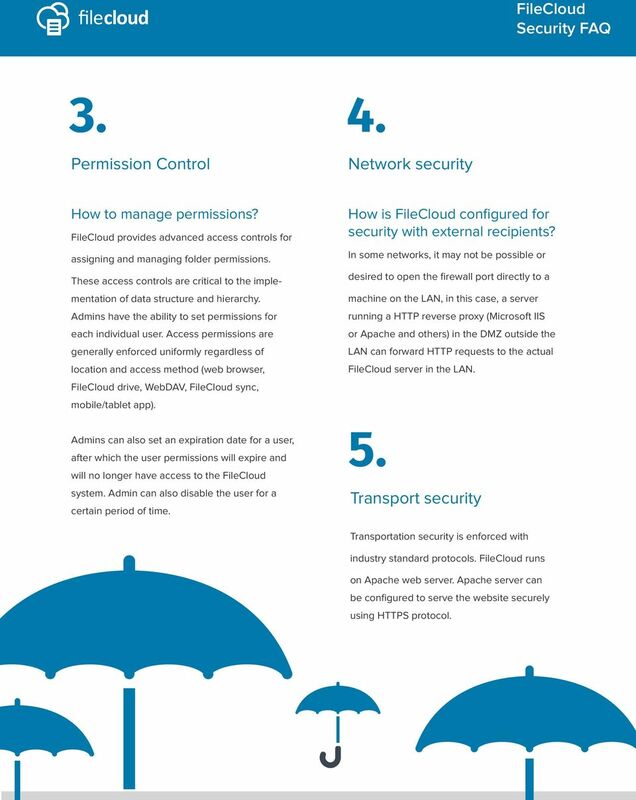 provides end-to-end data protection with multiple levels of security at each layer. With, one can be rest assured that corporate data is well protected in company servers and employee devices. 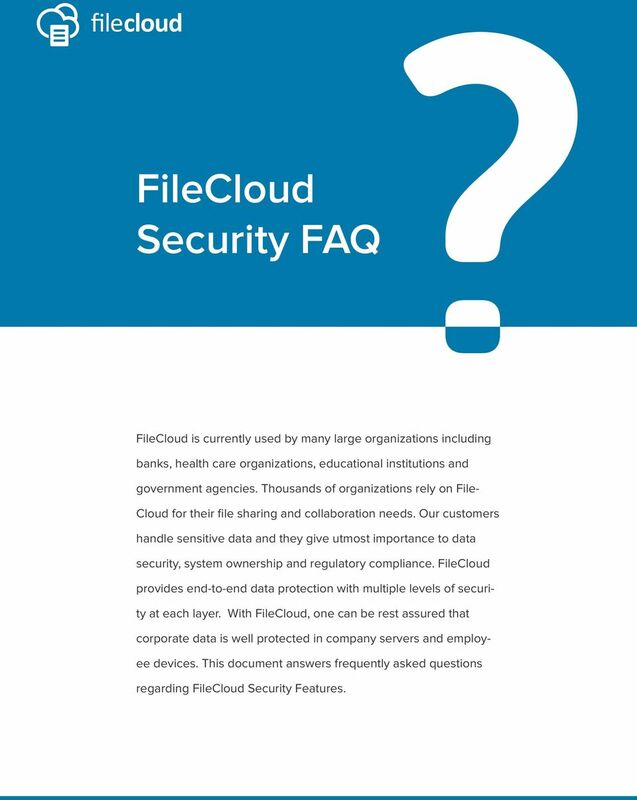 This document answers frequently asked questions regarding Security Features. 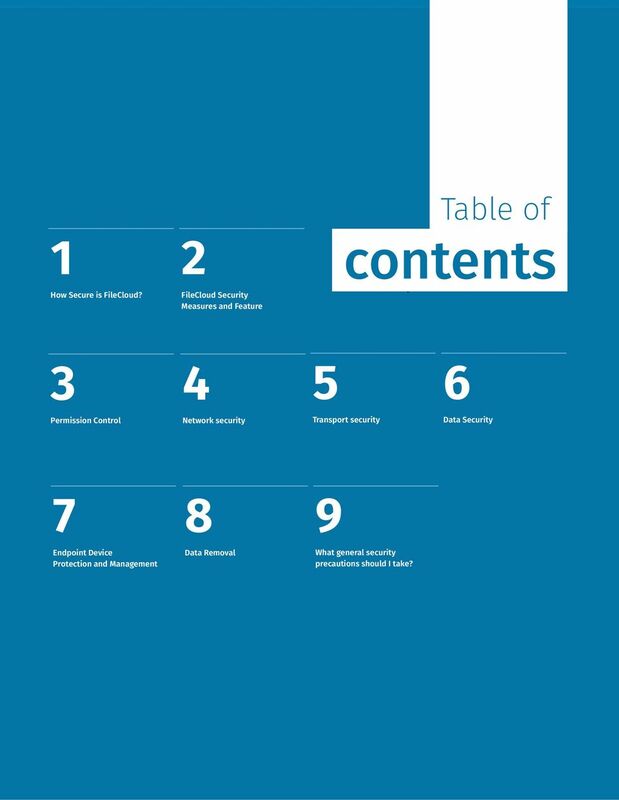 2 Table of 1 2 contents How Secure is? Security Measures and Feature Permission Control Network security Transport security Data Security Endpoint Device Protection and Management Data Removal What general security precautions should I take? 3 1. How Secure is? is completely secure and offers multiple levels of data protection. 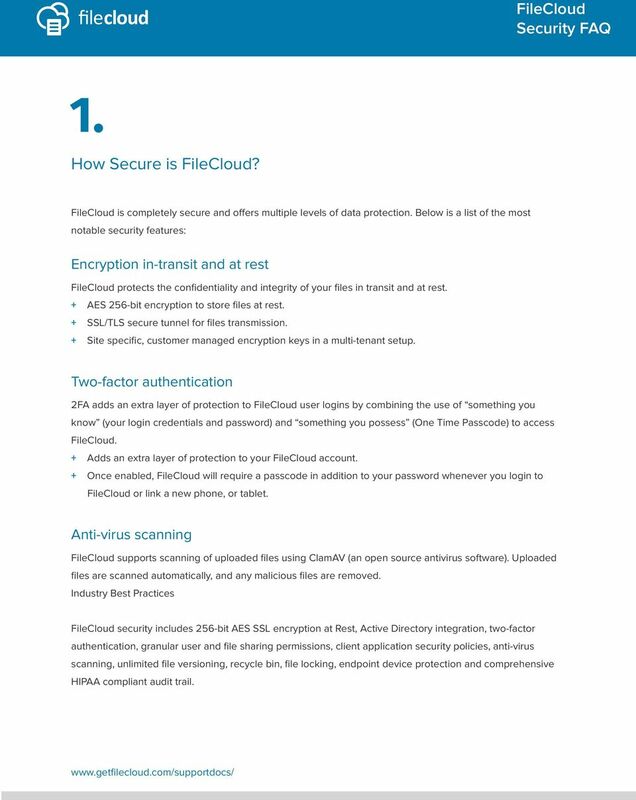 Below is a list of the most notable security features: Encryption in-transit and at rest protects the confidentiality and integrity of your files in transit and at rest. + AES 256-bit encryption to store files at rest. + SSL/TLS secure tunnel for files transmission. + Site specific, customer managed encryption keys in a multi-tenant setup. Two-factor authentication 2FA adds an extra layer of protection to user logins by combining the use of something you know (your login credentials and password) and something you possess (One Time Passcode) to access. + Adds an extra layer of protection to your account. + Once enabled, will require a passcode in addition to your password whenever you login to or link a new phone, or tablet. Anti-virus scanning supports scanning of uploaded files using ClamAV (an open source antivirus software). Uploaded files are scanned automatically, and any malicious files are removed. Industry Best Practices security includes 256-bit AES SSL encryption at Rest, Active Directory integration, two-factor authentication, granular user and file sharing permissions, client application security policies, anti-virus scanning, unlimited file versioning, recycle bin, file locking, endpoint device protection and comprehensive HIPAA compliant audit trail. 4 2. Security Measures and Features How can I control who is authorized to use system? supports integration with enterprise identity management systems such as LDAP and AD. Therefore, large organizations with existing authentication systems in place can choose to integrate their user accounts directly with their active directory deployment. This allows companies to embrace the cloud without decentralizing user management. As users are created and deleted from active directory, they can be automatically granted or denied access to. The full range of password, and lockout policies set in active directory are enforced across all access points. Organizations can also connect to AD over SSL. supports single sign-on through NTLM as well as SAML SSO. How is access control handled in? User authentication In most infrastructures, the login screen is the most exposed part of an application. 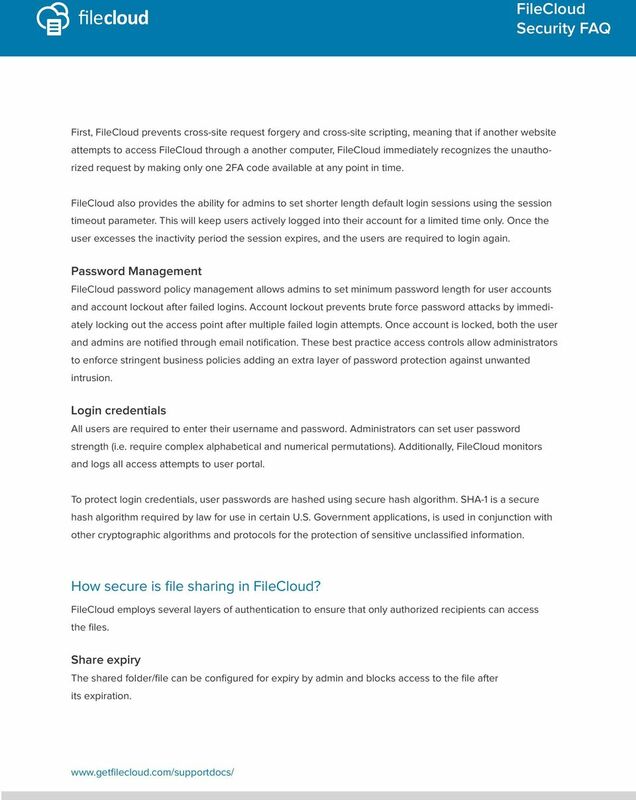 This is why enables strict user authentication and permission enforcement at every access point, ensuring that only users with the right credentials can access data. Two-factor authentication Most security threats today are a result of compromised user credentials. With 's two-factor authentication, users can require an extra 2FA code as part of the user authentication process. The additional login step requires users to verify their identity using 2FA code sent via , creating a double check for every authentication. Even without knowing the login information, unauthorized users can still find ways to access company data by piggybacking through the user's computer while logged in. This is true for any web application, whether accessing a bank account website or personal . is fully aware of these attempts and takes multiple steps to prevent unauthorized access after a user has logged in. 5 First, prevents cross-site request forgery and cross-site scripting, meaning that if another website attempts to access through a another computer, immediately recognizes the unauthorized request by making only one 2FA code available at any point in time. also provides the ability for admins to set shorter length default login sessions using the session timeout parameter. This will keep users actively logged into their account for a limited time only. Once the user excesses the inactivity period the session expires, and the users are required to login again. Password Management password policy management allows admins to set minimum password length for user accounts and account lockout after failed logins. Account lockout prevents brute force password attacks by immediately locking out the access point after multiple failed login attempts. Once account is locked, both the user and admins are notified through notification. These best practice access controls allow administrators to enforce stringent business policies adding an extra layer of password protection against unwanted intrusion. Login credentials All users are required to enter their username and password. Administrators can set user password strength (i.e. require complex alphabetical and numerical permutations). Additionally, monitors and logs all access attempts to user portal. To protect login credentials, user passwords are hashed using secure hash algorithm. SHA-1 is a secure hash algorithm required by law for use in certain U.S. Government applications, is used in conjunction with other cryptographic algorithms and protocols for the protection of sensitive unclassified information. How secure is file sharing in? employs several layers of authentication to ensure that only authorized recipients can access the files. Share expiry The shared folder/file can be configured for expiry by admin and blocks access to the file after its expiration. 6 File change notification Admin and users automatically receive notifications through when files are added, updated or deleted. administrators can enable/disable file change notification s to be sent whenever files have been changed. Download limit restrictions for public shares Download limit restrictions can be set for files, which are publicly shared. This limited the number of downloads thus reducing the risk of misusing the file. NTFS shares Many organizations have Windows-based network folders that are shared among employees. The permissions on these network folders are managed using NTFS rights setup for various users and groups (generally from active directory). can use the same NTFS permissions on the Network Folders for user authorization and access to these resources. How is data leak prevention done in? has unique capabilities to monitor, prevent, and fix data leakage assuring corporate data is protected across all devices (laptops, desktops, smartphone, and tablets). Remote wipe If a user loses a mobile device, the admin can remotely wipe the data off that device, protecting confidential files. Audit reporting Activity logs capture the, what, when, who, why, and how, attributes of every user action within the system. Admins can easily filter logs and identify problems. Block devices, clients In case of any suspicious activity, admins can selectively block devices, clients (e.g. sync) or permanently remove users from accessing the system. 7 3. Permission Control 4. Network security How to manage permissions? 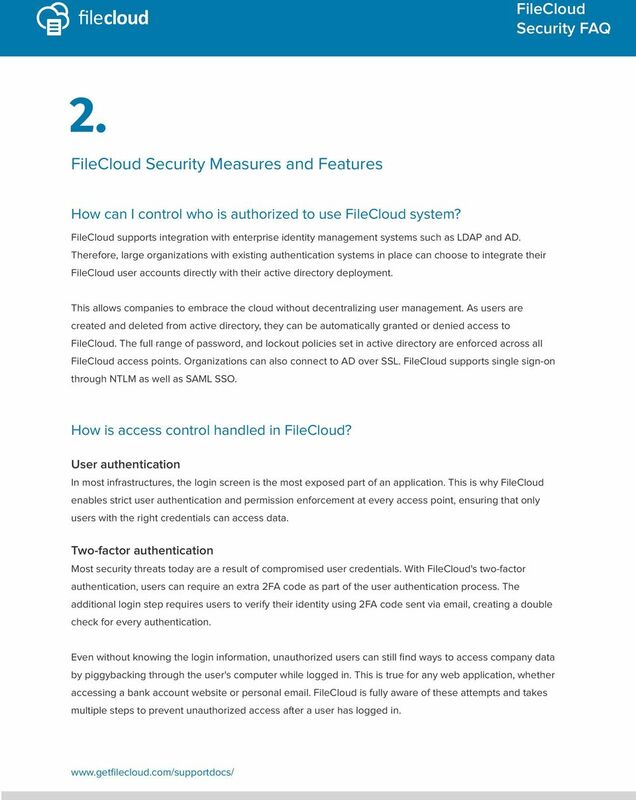 provides advanced access controls for assigning and managing folder permissions. These access controls are critical to the implementation of data structure and hierarchy. Admins have the ability to set permissions for each individual user. Access permissions are generally enforced uniformly regardless of location and access method (web browser, drive, WebDAV, sync, mobile/tablet app). How is configured for security with external recipients? In some networks, it may not be possible or desired to open the firewall port directly to a machine on the LAN, in this case, a server running a HTTP reverse proxy (Microsoft IIS or Apache and others) in the DMZ outside the LAN can forward HTTP requests to the actual server in the LAN. Admins can also set an expiration date for a user, after which the user permissions will expire and will no longer have access to the system. Admin can also disable the user for a certain period of time. 5. Transport security Transportation security is enforced with industry standard protocols. runs on Apache web server. Apache server can be configured to serve the website securely using HTTPS protocol. 8 6. Data Security How is data secured in? Storage level encryption supports storage level encryption, administrator may supply an optional master password and start the initialization process. Without a master password the encryption module cannot encrypt/decrypt files in the storage, which adds additional security to the storage system. Technical Details An asymmetric key pair (private/public) of 4096 bits RSA SHA-512 digest known as "Master" key is generated with the optional master password. A symmetric key of AES 128 bits known as "Plain File" key is generated. The File key created is encrypted using the Master Private key resulting in an "Encrypted File" key. All the existing unencrypted files (if they exist) in the storage will be encrypted before the system will be ready for use. File encryption File encryption is done using the Plain File key automatically. Since this encryption process is a symmetric operation, the time overhead added for this encryption is insignificant. 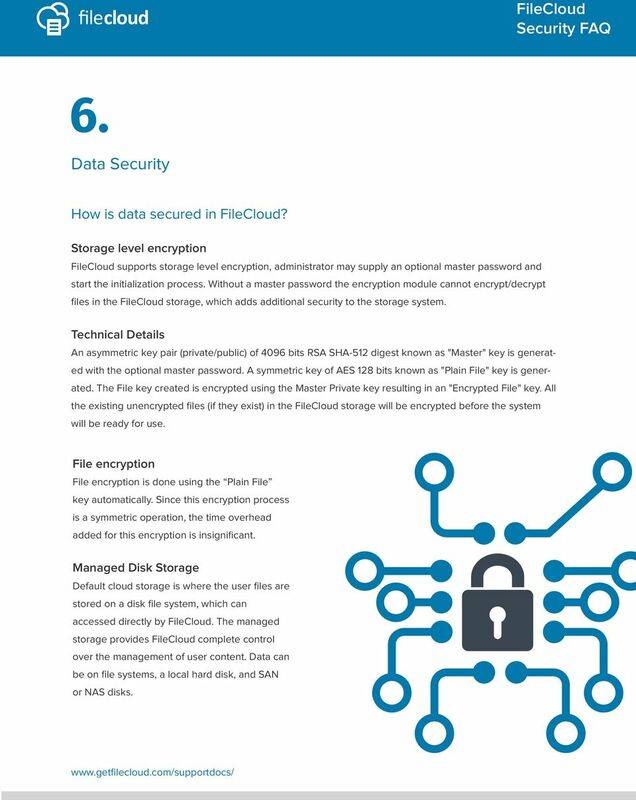 Managed Disk Storage Default cloud storage is where the user files are stored on a disk file system, which can accessed directly by. The managed storage provides complete control over the management of user content. Data can be on file systems, a local hard disk, and SAN or NAS disks. 9 7. 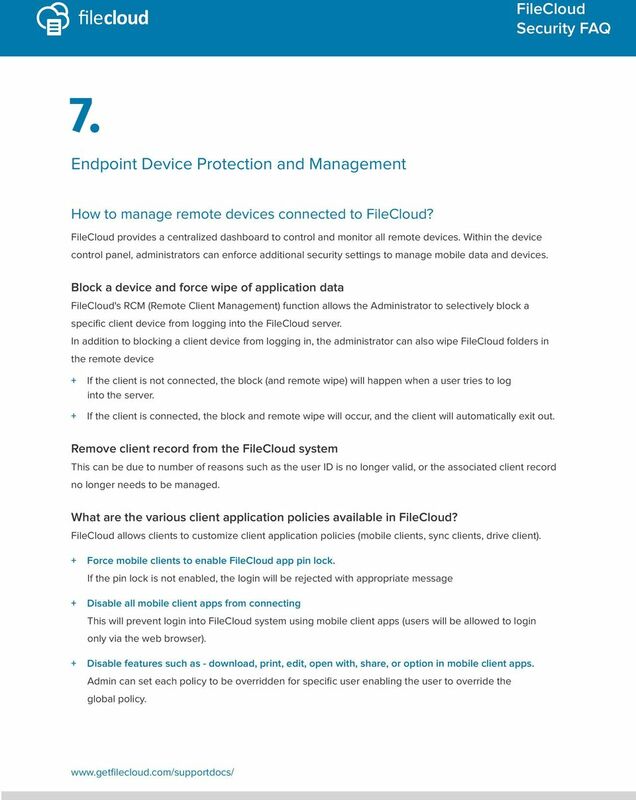 Endpoint Device Protection and Management How to manage remote devices connected to? provides a centralized dashboard to control and monitor all remote devices. 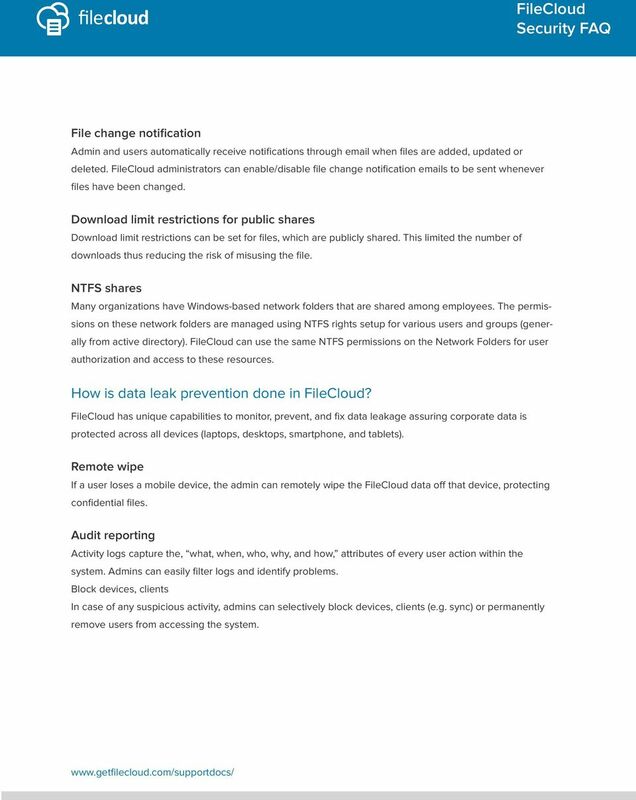 Within the device control panel, administrators can enforce additional security settings to manage mobile data and devices. Block a device and force wipe of application data 's RCM (Remote Client Management) function allows the Administrator to selectively block a specific client device from logging into the server. In addition to blocking a client device from logging in, the administrator can also wipe folders in the remote device + If the client is not connected, the block (and remote wipe) will happen when a user tries to log into the server. + If the client is connected, the block and remote wipe will occur, and the client will automatically exit out. Remove client record from the system This can be due to number of reasons such as the user ID is no longer valid, or the associated client record no longer needs to be managed. What are the various client application policies available in? allows clients to customize client application policies (mobile clients, sync clients, drive client). + Force mobile clients to enable app pin lock. If the pin lock is not enabled, the login will be rejected with appropriate message + Disable all mobile client apps from connecting This will prevent login into system using mobile client apps (users will be allowed to login only via the web browser). + Disable features such as - download, print, edit, open with, share, or option in mobile client apps. Admin can set each policy to be overridden for specific user enabling the user to override the global policy. 10 8. Data Removal Store Deleted Files This feature provides a way to keep deleted files in a "recycle bin. When this option is enabled and user deletes a file/folder, the deleted item gets moved into his/her personal deleted files area. Then the user can restore files from recycle bin or empty recycle bin completely. 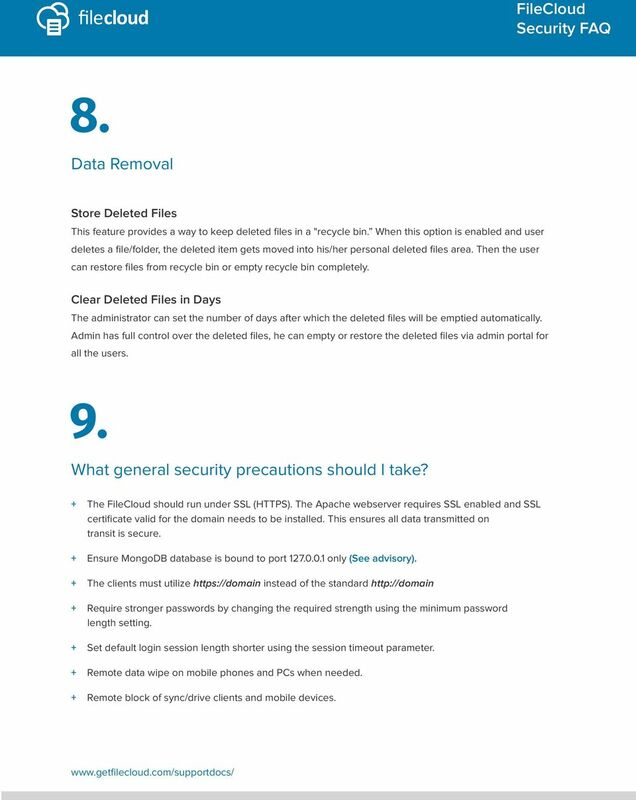 Clear Deleted Files in Days The administrator can set the number of days after which the deleted files will be emptied automatically. Admin has full control over the deleted files, he can empty or restore the deleted files via admin portal for all the users. 9. What general security precautions should I take? + The should run under SSL (HTTPS). The Apache webserver requires SSL enabled and SSL certificate valid for the domain needs to be installed. This ensures all data transmitted on transit is secure. + Ensure MongoDB database is bound to port only (See advisory). + The clients must utilize instead of the standard + Require stronger passwords by changing the required strength using the minimum password length setting. + Set default login session length shorter using the session timeout parameter. + Remote data wipe on mobile phones and PCs when needed. + Remote block of sync/drive clients and mobile devices. 11 + Enable detailed audit logs (What, When, Who, Why and How) + Enable two factor authentication for all user logins. 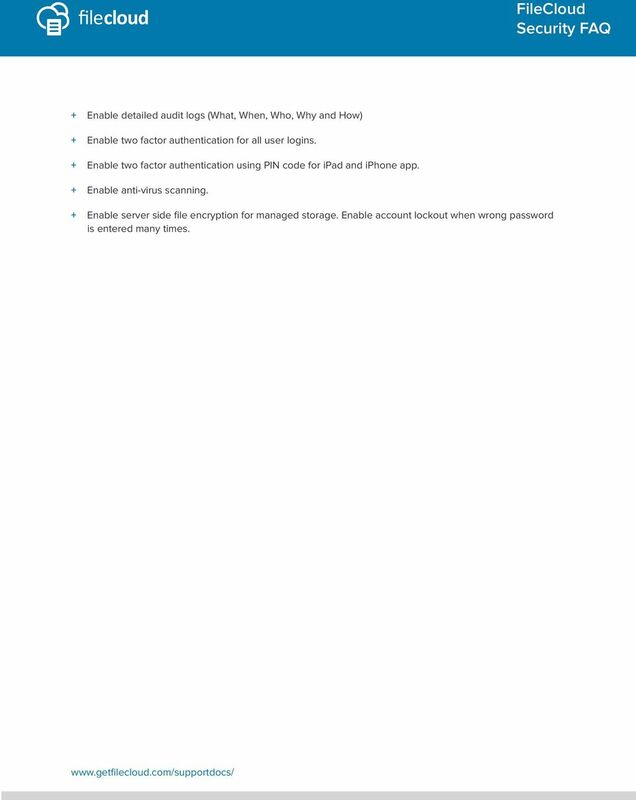 + Enable two factor authentication using PIN code for ipad and iphone app. + Enable anti-virus scanning. + Enable server side file encryption for managed storage. Enable account lockout when wrong password is entered many times. Abstract This paper describes EMC Syncplicity security features and controls for protecting enterprise data at the user, device, file, and folder level. Last Updated: March 2015 Copyright 2015 EMC Corporation.